I'm a sucker when it comes to a Donna VanLiere's Christmas book. Her Christmas reads are generally calm and pleasant and make you feel all warm and cheery on the inside. There's very little upset, the plot lines are very predictable and everything always ends well enough. I was excited to discover that there was a new VanLiere on the scene this December, that being The Christmas Town. 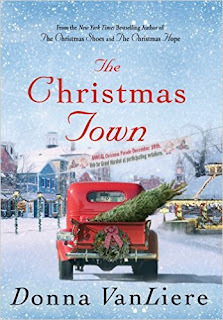 In The Christmas Town we meet Lauren Gabriel, a single gal who was raised in the foster care system and who really has no family of which to speak. She wants more than anything to spend Christmas with a family and so decides to place an ad on Craigslist looking for a home to share for the holiday. Meanwhile she finds herself engaged in a bit of drama one town over where she winds up being volunteered to work with the children's Christmas choir. Along the way she finds out that family isn't always what you think and that there is always hope. This book is a Hallmark Christmas movie waiting to happen with warm fuzzies and the promise of a new and better tomorrow all rolled into one. I know I'm making it sound a bit flippant but it is. Donna VanLiere books aren't exactly fine literature and I'd be silly to say so. Rather, they are just a cozy comfort read designed to suit the festive feel of this season. I've read and reviewed a few VanLiere titles around here and I'll link those titles in with this post. 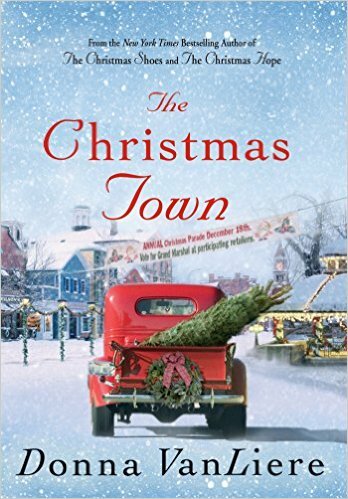 I don't know that I necessarily have a favorite out of these cotton candy reads, but I will say that I noticed some flaws in VanLiere's writing in The Christmas Town which had not caught my attention previously. Most notably is the fact that she kept changing tenses between the first and third paragraphs at the start of each chapter. It felt as if she couldn't decide if she wanted to reflect on what was, or set her story up in the present, or perhaps run a line of dialogue between her characters. The writing was choppy and jarring as a result. Clearly no one felt the need to take the time and edit in order to have the story flow with ease. While I was happy with the concept of the story, I thought this one was especially poorly presented and I can't say I enjoyed it very enthusiastically. I will also say that I was sent an "Advanced Uncorrected Proof", giving me more reasons to hate ARC's than ever before. What if they fixed the verbiage and everything ended up flowing together nicely instead of taking place in the past, present and future all at once? I don't know and can't tell you if an editor got their hands on a copy and straighten out the details. Perhaps so. Perhaps not. I'm not going to seek out a new copy in order to confirm that these mistakes were caught. As I said though, I don't really read VanLiere for the brilliant writing so much as the sappy Christmas story and on this point she delivered yet again. If you haven't ever given this author a try but you are looking for some good, clean Christmas fun than she's worthy of some consideration. Just don't go into one of her reads expecting anything brilliant. You can, however, expect some fun. I think this book could have used a lot more spit and polish than it received but despite that I got what I wanted out of it and so I'm happy. Many thanks to St. Martin's Press who sent a copy of this title my direction in order to facilitate this review. I received no additional compensation and all opinions expressed above are my very own. I'm currently listening to the audio version of The Christmas Town and really enjoying it. I have not noticed tense changes, so perhaps that was caught and corrected. I "discovered" VanLiere last year and listened to several of her books. Perfect light reading with a heart-warming Christmas-y feel. Thanks for sharing your thoughts. I do like some light reading this time of year. Maybe I'll check her out some time.